We're always on the hunt for newer places so when we heard of Margaritas II, we had to check it out. It replaced Santa Fe Tequila and from the photos I've seen of that place, Margaritas went and did a full remodel. We went on a Wednesday night with the two kids, and found parking directly in front on Woodbury Rd. If there's no parking there, you can find more behind the strip or on the adjacent side street. When we arrived, there was only one other party of two women so the place was pretty quiet. We were immediately greeted warmly by a younger man who sat us right in the front at a half booth half table, perfect for the toddler to sit comfortably. Soon another man who I presume to be the manager came by to welcome us to the restaurant, and he became our waiter for the night, with the host assisting at times. A Mexican flag inspired bowl of tortilla chips was brought out with some delicious salsa. We looked over the menu and began looking around at the detailed decor. Front to back the whole place is filled with Mexican art from paintings, sculptures wall hangings and wine bottles. Not a single section of the place was left untouched. Despite the various art with some looking like antiques, the whole vibe was modern and sophisticated. The candle chandeliers were warm and calming and added a nice accent. We decided to order some margaritas since after all, it IS the name of the place! We ordered the Margarita Special (Patron, Grand Marnier, lime juice, and a splash of OJ) and the Margarita Maya (Avion Blanco, Cointreau, pomegranate and tangerine juice). They were served in oversized wine glasses, like sangria would be served, and they were strong! If you love tequila, these drinks are for you! I didn't necessarily care for the Margarita Maya, it was a little too bitter for me but I did like the Special. Next time, I'll probably go with something a bit simpler, and smaller. We chose Jalapeno Poppers for an appetizer, which wasn't exactly at the top of my list but Mike insisted. I am so glad he did because they were great! 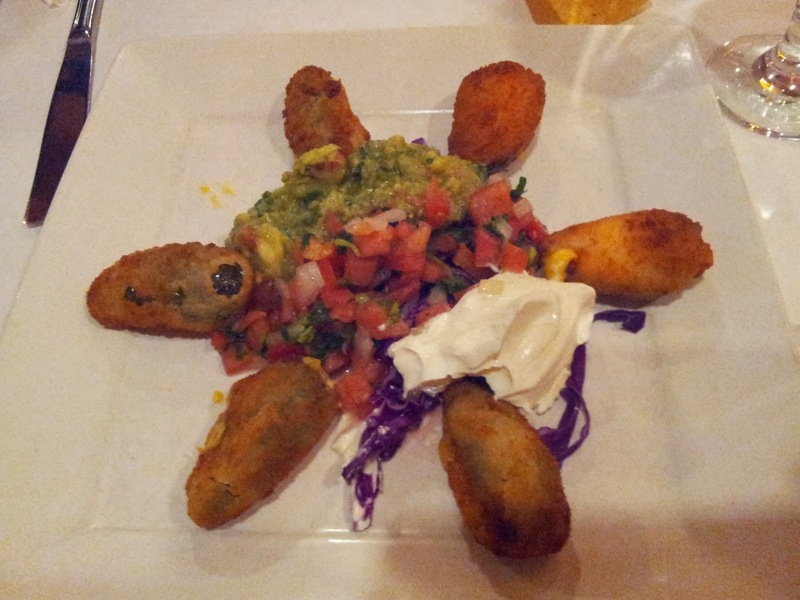 Crispy, whole jalapenos stuffed with cheese and served with sour cream, guacamole and pico de gallo in the middle of the plate. We didn't use all the guacamole for dipping the poppers so I slid the rest onto a small plate just so I could continue dipping the tortilla chips in it; I thought it was very good! Missing one, as soon as it came to the table one of the kids swiped it! For entrees we ordered the Chimichangas and Enchiladas Rojas Mixtas (1 each of steak, chicken and cheese). 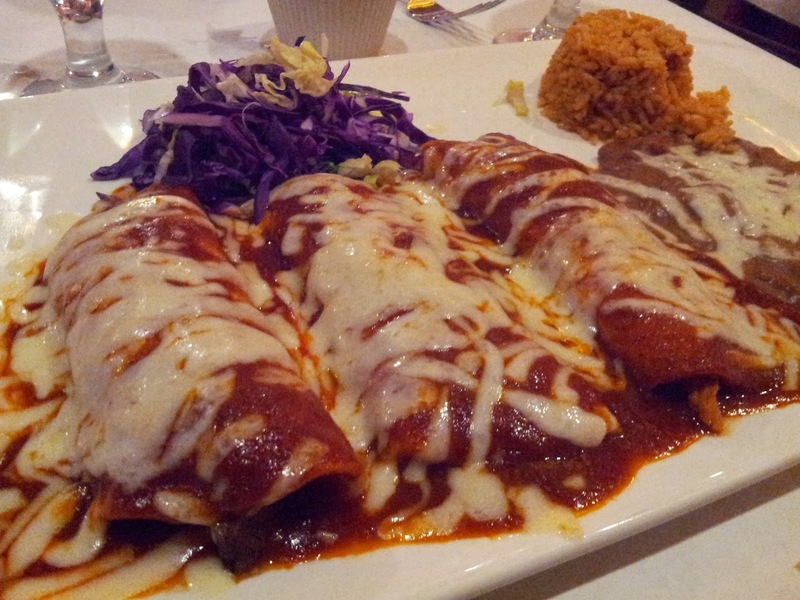 Each entree was served with refried beans and rice, a perfect accompaniment. As full as we were, we just had to try dessert since everything else had tasted so wonderful! We got the Fried Ice Cream and the Flan. The ice cream was nice and crunchy with the crushed cornflakes outside and still-cold ice cream inside, a big hit with the kids, and the flan tasted great but we were surprised at how thick it was! Not that we're complaining, it just wasn't like any flan we've had before. Knowing that, you can decide if you'll order it. Throughout the night, service was terrific. At one point, our youngest knocked over a glass of water onto the paper table covering and the host/waiter brought over some extra napkins, picked up the excess water and put down a fabric napkin as a placemat. All without us asking him to do a single thing. After the other table left, we were the only ones left in the restaurant and it was near closing, but we did not feel rushed at all. In fact, the manager came over and we started chatting away. 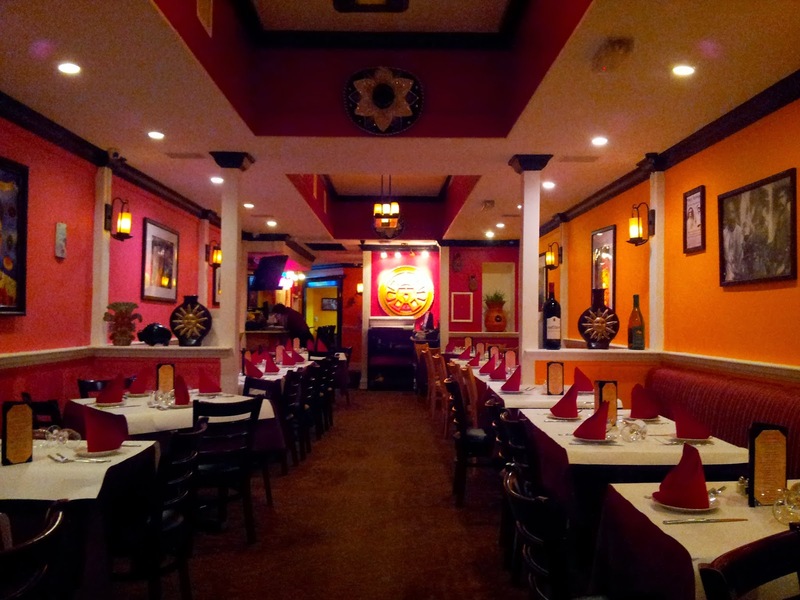 We found out that they have another location in East Meadow that gets much busier, and that they have a Mariachi band on Friday and Saturday nights. He told us they do catering in the back, so we went and took a look at the space. Through the first two dining rooms and past the bar, there is a corridor that brings you past the kitchen and into a small private dining room. You'd never know it was there! Overall, we'd say its definitely a restaurant to try out. 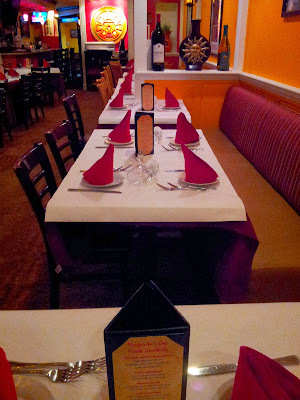 Next time we go, we'll try on a busier night to see if we can have a similar experience. There's no doubt that our kids will love the friday night Mariachi band, so hopefully we found a new local favorite!